Models provide a means for finding solutions to complex problems. 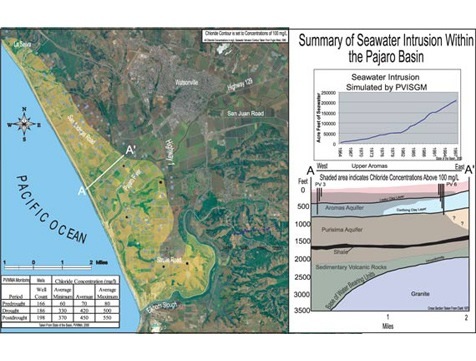 Hydrologic modeling provides the Agency with the means to evaluate the state of the Pajaro Valley Groundwater Basin, and the effectiveness of proposed water resource projects to determine the most effective solution to overdraft and seawater intrusion. Often, when people refer to “groundwater models,” what they are talking about are numerical (computer) models. Developing an accurate conceptual model is, perhaps, the most important step in any modeling project. 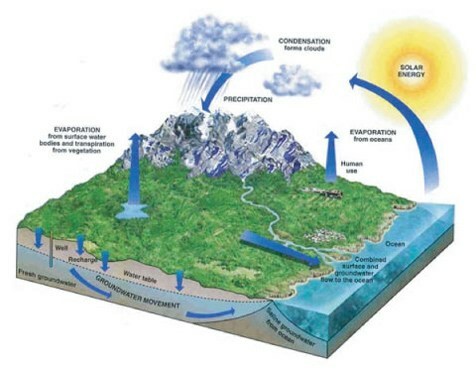 A conceptual model illustrates our understanding of how the hydrologic system works. Characterize the inputs and outputs of the hydrologic system as well as the geologic structure of the aquifers is an importatnt first step. Increasing population, agricultural development (including shifts to more water-intensive crops), and climate variability are placing increasingly larger demands on available groundwater resources in the Pajaro Valley, one of the most productive agricultural regions in the world. This study provided a refined conceptual model, geohydrologic framework, and integrated hydrologic model of the Pajaro Valley. The goal of this study was to produce a model capable of being accurate at scales relevant to water management decisions that are being considered in the revision and updates to the Basin Management Plan (BMP). 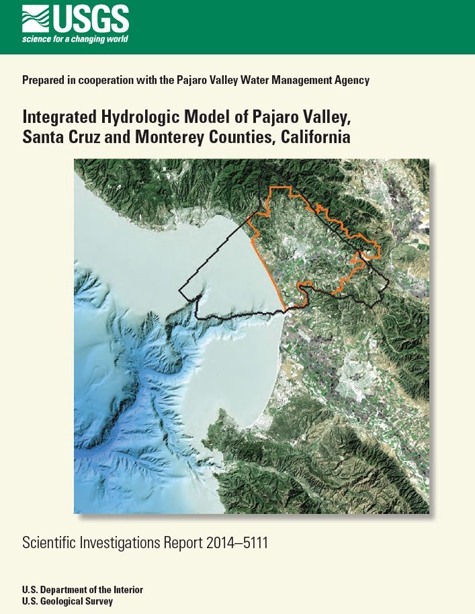 The Pajaro Valley Hydrologic Model (PVHM) was designed to reproduce the most important natural and human components of the hydrologic system and related climatic factors, permitting an accurate assessment of groundwater conditions and processes that can inform the new BMP and help to improve planning for long-term sustainability of water resources. Model development included a revision of the conceptual model of the flow system, reevaluation of the previous model transformed into MODFLOW, implementation of the new geohydrologic model and conceptual model, and calibration of the transient hydrologic model. The conceptual model identified inflows and outflows that include the movement and use of water from natural and human components. The groundwater flow system is characterized as a layered geologic sedimentary system through which downward flow is driven by the combined effects of the application of irrigation water at the land surface and the pumping of groundwater from deeper in the system. Overall, groundwater meets most of the agricultural demand in the initial part of the growing season, augmented by precipitation during wet winter and spring seasons. In addition, the amount of groundwater used for irrigation varies from year to year in response to climate variation and can increase dramatically in dry years. Data on agricultural pumpage is a major component of simulated outflow that was previously unavailable; therefore, a coupled farm-process model was used to estimate historical pumpage for Pajaro Valley by subregion (water-balance subregions) as well as the delivery of surface water to and from the Harkins Slough Aquifer-Storage-and-Recovery System (HS-ASR) and related Coastal Distribution System (CDS) since 2002. The new, integrated hydrologic model includes new water-balance subregions; delineation of natural, municipal, and agricultural land use; streamflow networks; regions of tile drains; and, the groundwater flow system. The redefinition of the geohydrologic framework and incorporation into the simulation revealed the importance of the confining units at the base of the alluvial deposits and between the upper and lower Aromas Sand for regional groundwater flow. The PVHM model, using MODFLOW with the Farm Process (MF-FMP2), is capable of being accurate at seasonal to interannual time frames and subregional to valley-wide spatial scales for the assessment of the groundwater hydrologic budget for water years 1964–2009, as well as potential assessment of the BMP components and sustainability analysis of conjunctive use. The model provides a good representation of the regional flow system and the use and movement of water throughout the valley. Simulated changes in storage over time show that, prior to the 1984–92 dry period, significant withdrawals from storage occurred only during drought years. Since about 1993, growers in the Pajaro Valley have shifted to more water intensive crops, such as strawberries, bushberries, and vegetable row crops, as well as making additional rotational plantings, which have increased demand on limited groundwater resources. Simulated groundwater flow indicates that vertical hydraulic gradients between horizontal layers fluctuate and even reverse in several parts of the basin as recharge and pumpage rates change seasonally and annually. The majority of recharge predominantly enters the Alluvial aquifer system, and along with pumpage and the largest fractions of storage depletion, occurs in the inland regions. Coastal inflow as seawater intrusion replaces much of the potential storage depletion in the coastal regions. 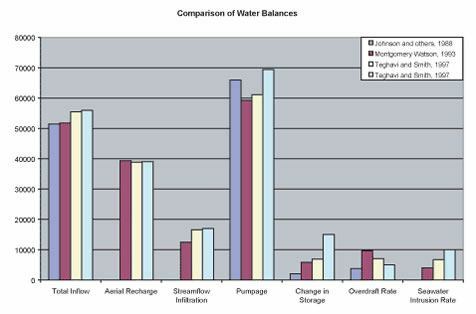 The simulated long-term imbalance between inflows and outflows indicates overdraft of the groundwater basin averaging about 12,950 acre-feet per year (acre-ft/yr) over the 46-year period of water years (1964–2009). Annual overdraft varies considerably from year to year, depending on land use, pumpage, and climate conditions. Climatically driven factors can affect inflows, outflows, and water use by as much as a factor of two between wet and dry years. Coastal inflows and outflows vary by year and by aquifer; the net coastal inflow, or seawater intrusion, ranges from about 1,000 to more than 6,000 acre-ft/yr. Maps of simulated and measured water-level elevations indicate regions with water levels below sea level in the alluvium and Aromas layers. Ongoing expansion of local hydrologic monitoring networks indicates the importance of these networks to the understanding of changes in groundwater flow, streamflow, and streamflow infiltration. In particular, the monitoring of streamflow, groundwater pumpage, and groundwater levels throughout the valley not only indicates the state of the resources, but also provides valuable information for model calibration and for model-based evaluation of management actions. The HS-ASR was simulated for the years 2002–09, and replaced about about 1,290 acre-ft of coastal pumpage. This was combined with the simulation of additional 6,200 acre-ft of deliveries from supplemental wells, recycled water, and city connection deliveries through the CDS that also supplanted some coastal pumpage. Total simulated deliveries were 7,350 acre-ft of the 7,500 acre-ft of reported deliveries for the period 2002-09. The completed CDS should be capable of delivering about 8.8 million cubic meters (7,150 acre-ft) of water per year to coastal farms within the Pajaro Valley, if all the local supply components were fully available for this purpose. This would represent about 15 percent of the 48,300 acre-ft (59.6 million cubic meters) average agricultural pumpage for the period 2005 to 2009. Combined with the potential capture and reuse of some of the return flows and tile-drain flows, this could represent an almost 70 percent reduction of average overdraft for the entire valley and a large part of the coastal pumpage that induces seawater intrusion. There have been four basin wide models compiled for the Pajaro Valley Aquifer System. Three of the models utilized the Integrated Surface Water Groundwater Model (ISGM) code (Montgomery Watson, Teghavi and Smith) and one utilized Modflow 1988 modeling code. The annual model water budgets have been summarized in the comparison plot above. 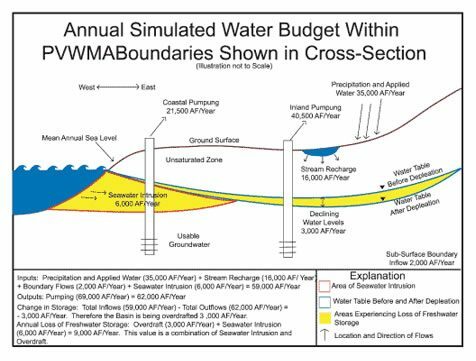 PVWMA utilized the modeling from Teghavi and Smith to analyze the effectiveness of the groundwater supply options brought forward in the Revised Basin Management Plan (2000).